Tonight is the final dress rehearsal for the show that my husband and I are directing, "Into the Woods" at South Bend Civic Theatre. It's been a long haul, since BEFORE auditions in mid-May, to get to where we are now. At this point, there are just some finishing touches, some tweaks, some final details left, and it will be a beautiful thing. It's amazing what goes into a process and what comes out on the other end. People that come to see the show will, I hope, be greatly pleased at the beautiful set, costumes, lighting, music, and the incredible talent of all of our actors on stage, and the crew backstage as well. They will not know any of the story of the countless hours of effort that each person went through to get it to the point it's at when it's seen on stage. We each had our own Journey taking us there, our tears and our laughter, our seemingly endless notes, sleepless nights, ad infinitum. It reminds me of our actual Journey here. Though our lives may intersect, not a single one of us has lived the life of anyone else. Though we can empathize with their hurts and struggles, we're usually more focused on our own. Though we can respond with kindness, we all-too-often choose selfishness. When we are overwhelmed, we lash out. When we are on edge, we push other people over in an effort to save ourselves. What if, instead, we grabbed on and held each other? This week has been frustrating, high-stress, and difficult all around, but it's leading into something incredible that will never be duplicated. And that, my friend, is a metaphor for your life. Overwhelming Overwhelmment: my life for the past several months. 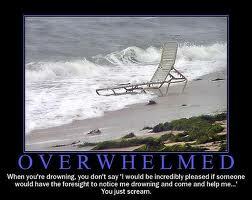 Definitely drowning in overwhelmment. Hoping it lightens up a bit when the kids go back to school, but truthfully, it started while they were in school, so... we'll see. I feel like we might be leading somewhat parallel lives, since everything you write about pertains significantly to my life. I feel like we all lead parallel lives... even people who don't think they have much in common probably have 150% more in common than they think they do. That's why we're all in the Journey together. Praying for you.